E-liquid (also known as e-juice) is the substance inserted into an electronic cigarette which gives e-cigarette vapour its flavour and nicotine (if the vaper is using nicotine e-liquids). When the e-cigarette is in use, the e-cig battery will heat up the e-liquid, turning it into a smooth vapour when inhaled. Offering complete versatility, e-liquids allow vapers to experiment with e-liquid flavours in a choice of non-nicotine or nicotine strengths. 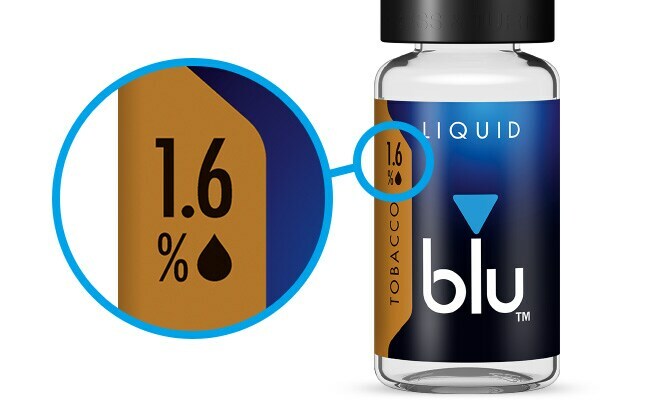 At blu, our e-liquids are offered in 0%, 0.8% and 1.6% nicotine strengths. Nicotine strength selection largely depends on how much nicotine the vaper is used to inhaling. See our product pages for information on nicotine strengths included in blu® Liquids. Want more for your blu® cig? E-liquids from blu are manufactured using imported ingredients in the USA. Whether customers are looking for nicotine e-liquids or 0% nicotine e-liquid, at blu we have a selection of products to choose from. Compatible with the blu PRO® products, blu® Liquids are available in a number of flavour options to suit various tastes, available in our online store.